L to R: Roberta Little, Lisa Royar, Dodi Walker, Lynette McHone, Kim McKinnon, Joanna Jones, Barb Speer & Donna Johnson. 22 Barb Speer 5' 10" F Soph. Bushnell High School, Ill.
23 Donna Johnson 5' 3" G Fresh. Northwestern High School, Ill.
30 Lisa Royar 5' 9" G/F Fresh. Knoxville High School, Ill.
32 Joanna Jones 5' 10" G/F Fresh. La Harpe High School, Ill.
35 Kim McKinnon 5' 11" F Fresh. 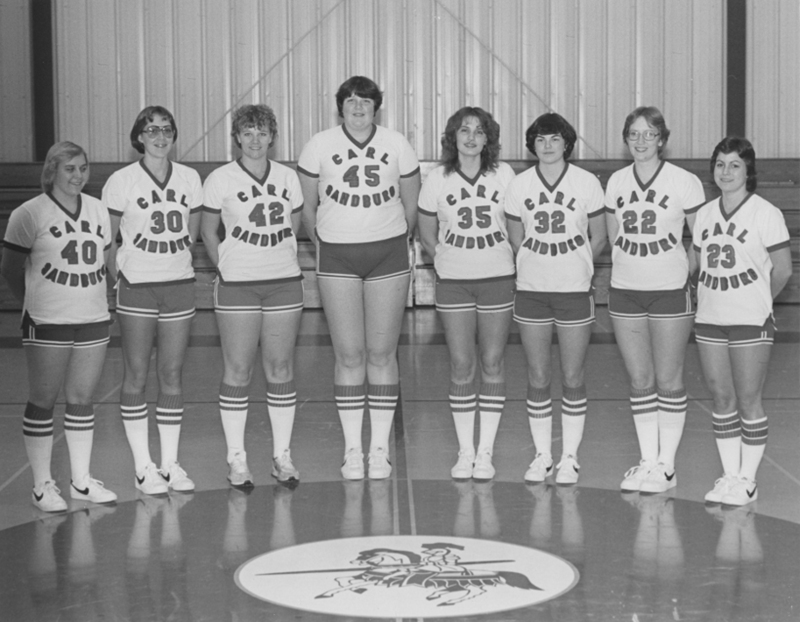 La Harpe High School, Ill.
40 Roberta Little 5' 3" G Fresh. Williamsfield High School, Ill.
42 Dodi Walker 5' 9" C/F Fresh. Spoon River Valley High School, Ill.
45 Lynette McHone 6' 3" C Fresh. Industry High School, Ill.